Free expression withstood a wide range of attacks in 2018. 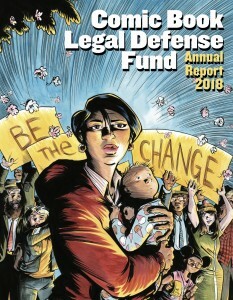 Thanks to donors like you, CBLDF was at the forefront, protecting our community from an increasing tempo of challenges to comics and other expressive material. From providing legal aid and expertise to protecting access to valuable books, CBLDF was on the front lines of the fight for free expression. CBLDF intervened in nine cases, working behind the scenes to offer legal knowledge before the cases went to court. Cases ranged from providing legal advice to publishers and creators, to a flurry of customs crises, in which comics readers had their packages seized at the border. We also were able to develop and present two new presentations about the power of comics as free expression. Thanks to supporters like you, our presentations reach thousands of people all over the world each year. We’re proud to share this important work with you in our 2018 Annual Report, which you can read in full below. These are embattled times for the First Amendment, and CBLDF’s work is essential to preserving the rights it guarantees the comics community. Please help us advance this important work by making a tax-deductible contribution today!